In 2012 we harvested our olive groves for the first time and we were amazed at the difference, nothing like any other olive oil we had ever tasted. It was so good that family and friends encouraged us to import it to the UK on a small scale, just to start with. So we decided to look into the properties of olive oil and the more we read the more we were convinced that we had something very special, in fact quite unique. 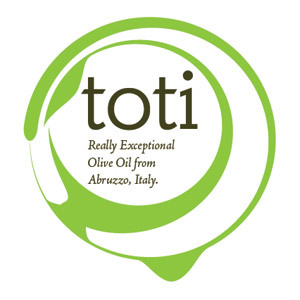 Toti oil, (so called because it is harvested from the Toti groves near Elice) is a bright green colour and cloudy. It is so far removed from anything you can buy in the supermarkets; it hardly resembles what we know as olive oil. We bottle and can it on the day of pressing thereby capturing the freshness of the oil. We put the harvested by date on the label so you can see how long it has been in the bottle, not a best before date. The olive harvest is from the middle of October to the middle of November in Italy. The weather is usually warm and sunny so makes for a very pleasant way to spend your days. With this in mind, a good idea struck me that maybe friends and family would like to come out to Italy, stay in one of our beautiful houses, eat fantastic Italian food, drink great local wine and help with the harvest, become wrapped up in the authentic Italian experience. So I spoke to Luigi, our ‘Capo ‘ and his wife Gabriella who seemed delighted with the idea of spare labour to help get everyone’s harvest in. So, buoyed up with enthusiasm for this idea I posted a note on FaceBook saying was anyone interested in helping out. I was inundated with offers from friends far and wide; they all thought it was a splendid idea. Old school friends, family friends and their offspring came out to ‘live the experience’. Heather getting to grips with the nets!! Come on 'Edda!! I have to say, we laughed and laughed, we ate and ate, we drank grappa at nine in the morning (offered by the locals! ), endless coffee, glasses of wine and it has to be said we worked hard! It’s not such a stroll in the park as I had imagined but a great feeling at the end of the day, with a tractor laden with olives as we set off to the olive press with the rest of the community to convert our olives into the precious liquid gold oil. The olive press experience is also something to behold, it seems to me whatever time you turn up at 8am or midnight there is always a warm welcome and a cheery smile. They work 24 hours a day during harvest and never seem fed up. Coffee and wine, cake and brioche always on offer along with smiles and chats, local updates and bits of gossip – it really becomes the heart of the community. After we got home, tired and weary from our labours I foolishly asked Heather if she’d write an account!! See what she produced below!! An account of the week’s olive picking! It was such an innocent statement on ‘HOUSES IN ITALY’S” Facebook page asking whether anyone fancied helping with the olive harvest. I should have known, after all it was Sophie behind the innocent sounding invitation. However, by then I was already enjoying the most perfect of holidays as a guest at the beautiful Casa Mimosa high up in the Abruzzo hills. Long lazy breakfasts interrupted by a little light olive tree tickling before resuming position at a lunch laden table with stunning veranda views and a welcome uninterrupted siesta. Perhaps a little more dancing in the olive groves before getting down to the serious business of sundowners and cordon bleu dinners whilst sniggering at our school girl exploits and musing over the intervening years. We would collectively congratulate ourselves on our accomplishments and exaggerate our achievements. A feeling of mellow contentment settling upon us before heading upstairs to sumptuous en suites and long languorous sleeps. Er no! Wrong! Okay, so the digs were delightful and the company unchanged from misspent school days (although thank heaven for the addition of one intelligent friend Maddy, who was fast tracked to be ‘head girl’ for the week as no-one suitable could be found amongst the old fishes (school name for old girls who left New Hall!.) This was patently obviously no holiday! Sophie was stomping around in her farmer’s boots delivering encouragement loudly at the top of her voice, to the tune of ‘ COME ON HEATHER’ or whoever was nearest and gabbling with Luigi whilst we all shook in our boots , thanking our lucky stars that amongst our overfilled hand luggage we had packed scruffy shorts and knackered trainers! Editor’s note – I didn’t see Heather ‘scamper’ by the way!! As you have probably guessed we had a great time and have produced some fantastic olive oil as well. If you would like to buy some we can deliver within a 50 mile radius of Salisbury/Winchester or we can mail order it to you. Please email: office@houses-in-italy.co.uk for ordering oil. Open this link that came from the USA. A massive amount of research has been carried out and read for yourselves the benefits. Click here to read about the benefits of olive oil.